CINCINNATI - Andy Dalton's passing hand was finally free on Tuesday, liberated from the black cast that has covered his right forearm and his spirits for the past three weeks. And his coach held out the possibility he might have a backup role for the Bengals' playoff game. Call it one for the thumb. Dalton ran a couple of plays early in practice on Tuesday and threw a pass — with his left hand — before raising his arm in celebration and heading back to the sideline to continue his conditioning work. What are the chances he could be on the active roster when the Bengals host the Pittsburgh Steelers on Saturday night? "I'd love to be in there playing," Dalton said. His right thumb will likely prevent it. The AFC North champions are getting AJ McCarron ready to play against their division rival. Dalton broke the thumb on his passing hand while making a tackle during the Steelers' 33-20 win at Paul Brown Stadium on Dec. 13. McCarron went 2-1 as a starter in the past three games. Although Dalton got the cast removed on Monday, he has to rebuild the strength in his hand. Also, he hasn't practiced in three weeks, leaving him rusty — a bad combination for playoff time. So the Bengals are heading into the playoffs with McCarron as the starter. "This team's built for this kind of stuff," Dalton said. "AJ's going to do a good job when things happen." Coach Marvin Lewis indicated on Tuesday that there's a possibility Dalton could be active as a backup, depending upon how his hand feels. The Bengals don't have an experienced backup should McCarron get hurt. Receiver Mohamed Sanu has taken snaps in wildcat formations and could be an emergency quarterback. So McCarron will get a chance to overturn a lot of bad history in his fourth NFL start. The Bengals haven't won a playoff game in 25 years, the sixth-longest post-season drought in NFL history. They're the only team in league history to lose an opening-round game four years in a row. And no quarterback with so little starting experience has won a playoff game since 1979, when Gifford Nielsen led the Houston Oilers to a win in San Diego, according to STATS. McCarron thinks his bowl experience while winning two national titles at Alabama will help him in the playoffs. "I feel like this is comfortable," he said. "I get to go home to my house every day and see my wife and the little dog and sit on the couch and watch (game) film and make her watch some." And then he gets a chance to show how far he's grown in the past month. 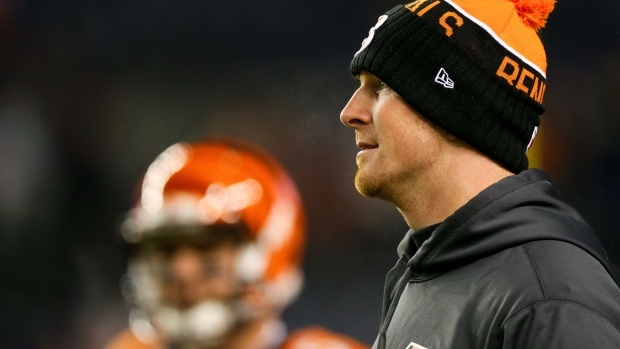 The second-year quarterback got his first significant playing time when Dalton broke his thumb during the first quarter of the loss to Pittsburgh. McCarron threw a pair of interceptions, one of which was returned for a touchdown that put Pittsburgh in control. Thrown into the game on such short notice, McCarron felt like a teenager again. "For the first couple of snaps, it kind of reminded me of my first high school game," McCarron said on Tuesday. "When I came to the sideline after two possessions or something, I asked my offensive co-ordinator: Did they have more than 11 people on the field?'" McCarron was a lot better in the past three games. He didn't throw an interception, although he fumbled a snap that ended a 20-17 overtime loss in Denver. He's looked more like a rookie at times against some of the league's best defences, but he's also made some impressive throws, too. And he's grown a lot since that last game against the Steelers. "Just the poise," offensive co-ordinator Hue Jackson said. "Obviously he's done a really good job of not turning the ball over. In that game we had two turnovers. That kind of led to our demise on offence and losing the game. I think if you take care of the ball and play the way we have, you have a chance to have great things happen." Notes: The Bengals weren't required to provide a practice report on Tuesday. They'll have one on Wednesday indicating which players are limited. ... They signed LB Jayson DiManche to the practice squad. The Bengals waived him earlier this season, and he played one game for Cleveland. ... McCarron recalled that after the loss to Pittsburgh, he talked to Ben Roethlisberger and told him that he'd watched him play with Miami (Ohio) in the 2003 GMAC Bowl in Mobile. "After the (GMAC) game, I went under the stadium to the locker room, met his mom, his dad, his sister and him," McCarron said. "I remember he gave me a wristband and some other stuff and how cool it was. I told him after the last game, and he started dying laughing."